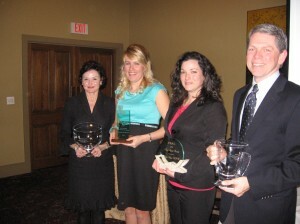 The Public Relations Association of Louisiana honored four communications professionals at its annual banquet held yesterday, January 22, 2013. Honorees are selected based on a nomination process and then voted on by an awards committee. This year’s awards recipients include the following: Bob Mann, Communicator of the Year; Sadie Wilks, APR, First Circle; Mary Beth Chevalier, APR, Practitioner of the Year; and Venessa Lewis, APR, Member of the Year. PRAL also conducted the installation of the 2013 PRAL board of directors at the annual event.